Where can a boy read, and get inspired, about getting fit, cooking a meal, riding a horse, exploring a cave, identifying trees, leading an expedition, gazing at the stars, catching a fish, and saving a life? If you’ve guessed the BSA Fieldbook, you either spend a lot of time at the Scout Shop or you already own a copy. If your troop program is stuck in a rut, or if you tend to do the same adventures year after year, a copy of the Fieldbook in the hands of an enthusiastic patrol leader or SPL can reinvigorate your troop. The Fieldbook goes way beyond the “how-to” of outdoor skills, and every chapter holds inspiration and ideas on adventures from a local orienteering outing to a hike on a trail spanning thousands of miles or a float trip on some of America’s most scenic waters. There’s not a boy alive who wouldn’t find something interesting to do in the Fieldbook. 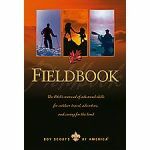 The current Fieldbook is the 4th edition, in print for about eight years now. It builds on a strong tradition of Fieldbooks which date back to 1944 (Colorado’s Troop 97 has an extensive history of the Fieldbook on its website). Each edition has remained in print for an average of twenty years or so, meaning that the current edition will most likely be with us for a while. Most of the information never goes out of date, though, and that which does change can be updated in the various printings that occur every couple years or so. Possibly best of all, BSA Supply Division and Scout shops have recently reduced the price from the original $20 to just $9.99, making it more affordable. And at that price, no serious Scout or Scouter should be without a copy. I must have read my first Fieldbook 20 times. A constant companion for several years. I took my Fieldbook on campouts, not my Handbook. My first Fieldbook is the Second Edition. I also have a Third and Fourth Editions. I’m partial to the Second because I’m old and that way, but I can appreciate the new Fourth Edition. It has good stuff. I really wanted to like the new Fieldbook, but I can’t. I loved the 2nd edition to death when I was a Scout, but this one just seems blah. None of the chapters go deep enough to provide real information, they are just an overview before you go read the real book on the subject. I can think of five or eight books I’d recommend over the current Fieldbook. For example, the Backpacking merit badge pamphlet is really good, a much better introduction than the Fieldbook chapter. Previous PostPrevious Your second full-time job?